In recent years though, I’ve run across several team books that have not only held my interest, but have proven to be truly excellent reads throughout -- Marvel’s Thunderbolts and Dark Avengers, and DC’s Secret Six, for instance. All three have two elements common among them: They’re all relatively new series, and all of them involve teams that are comprised of villains and/or anti-heroes. I suppose that, given my massive collection of Punisher and Wolverine comics, I probably should’ve seen that coming . . .
That being said, let’s take a closer look at Dark Avenger’s first story arc, Assemble. Essentially serving as the first major story beat under Marvel’s recently wrapped company-wide storyline, "Dark Reign," Assemble serves as the origin story for the Dark Avengers. Who are the Dark Avengers? Well, they’re basically the normal Avengers, but DARK. 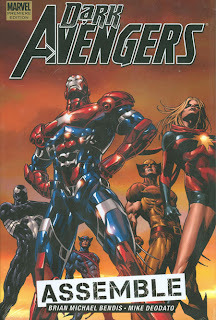 The Dark Avengers are a team of super villains, “assembled” by head of H.A.M.M.E.R. (presently S.H.I.E.L.D. ), former-Green Goblin and media/political darling Norman Osborn. Their role in the Marvel Universe is to serve as the public face of Osborn’s regime. On the outside, they don the costumes and titles of recognizable and time-honored heroes, meaning Venom is now “Spider-Man,” and Wolverine’s spiteful, vengeful, bisexual, over-exposed and Punisher-killing son, Daken, is now masquerading as “Wolverine” himself. The whole point of the Dark Avengers is that, their actions -- however beneficial to the people of Earth -- ultimately adhere to the will and nefarious machinations of Norman Osborn. Writer Brian Michael Bendis manages to cover a lot of ground in this first story arc, all while managing to keep continuity neophytes up to date (including me). In order, we get the obligatory “how they all came together” sequence, immediately followed by the team’s first field deployment. Being as this is a book about villains masquerading as heroes, it’s only appropriate that the Dark Avenger’s first mission is to rescue Dr. Doom, a member of Norman Osborn’s recently installed string-pulling Cabal organization, from the wrath of the vengeful time-traveling sorceress Morgan Le Fay. Casting Morgan Le Fay as the villain of this first story arc in the series turned out to be a wise decision, as her magical abilities make her a formidable opponent to everyone on the Dark Avengers roster (the Superman power-leveled Sentry included). As well, it adds an interesting dynamic to the story to know that, despite Le Fay wanting to kill the central characters of the story, her intentions are righteous in the sense that she’s trying to prevent the formation of the Cabal, and thus pre-empt the entire "Dark Reign" storyline. The protracted battle sequence set on Dr. Doom’s home turf of Latveria that dominate most of the pages of this story, with art by Mike Dedato, is exciting and beautifully rendered, with some genuine drama throughout as the heroes battle the demons and monsters at the command of Morgan Le Fay. Despite what could have been a confusing mess, the plot is well-structured, with wonderfully kinetic pacing that makes the book hard to put down. I particularly enjoyed the two independent sub-plots involving Norman Osborn and The Sentry and each's questionable grasp of reality. Both characters have always been a little loopy, but in this instance, Brian Michael Bendis puts these issues front and center, causing the reader to question both whether Osborn’s going to put on the Goblin costume again, and whether the Sentry has any clue just what he is or how much power he has at his command. It’s a thing of beauty watching Sentry repeatedly perform the superhero equivalent to miracles, only for the next panel to cut back and show the Dark Avengers, his teammates, wide-eyed and quaking with fear over obscene power wielded by their unstable comrade. My one gripe with the story progression in this arc was the fact that some characters definitely could’ve used so more air time for us to get to know them better. In particular, Daken (the dark "Wolverine") and Marvel Boy ("Captain Marvel") seemed to get the short end of the stick in terms of characterization, while characters like Ares were at least given a panel or two teasing the reader of future plotlines. As is the norm for Bendis stories, the dialogue is a highlight. While his forte seems to lean more towards the humorous and childishly immature, Bendis’ dialogue is, at the very least, always entertaining. Some characters, like Bullseye (“Hawkeye”) and Ares, are played for laughs, but on the other side we’re given characters like Moonstone (“Ms. Marvel) and Norman Osborn who speak with an uncommon level of measure and articulation. It goes a long way towards legitimizing Assemble as a serious story arc. In other words, though you’ll sometimes find yourself rolling your eyes and snorting at the silliness of the some of the exchanges and asides, you’ll never be bored reading Dark Avengers. In particular, Bendis’s use of Mac Gargan’s Venom as a comedic element is just about spot-on perfect. Deodato was an excellent choice of artist for Dark Avengers, if not for his realistic style, which is wholly appropriate given the political nature of the story, then for his versatility. Whether the characters in his panels are fighting demons and dragons, or sitting in a TV studio doing an interview, everything is brilliantly rendered, and framed in an effective and cinematic fashion. By the way, you’ve probably read it elsewhere, but I suppose it’s worth noting that, yes: Mike Deodato did in fact use actor Tommy Lee Jones as a reference for Norman Osborn. Some have complained that they find it distracting, but personally; I kind of liked it. Come to think of it, I liked this comic. It was by no means perfect, but Dark Avengers: Assemble held my interest throughout with it’s roster of colorful, identifiable, and ultimately dysfunctional characters and the frequent shenanigans/interplay between them. I haven't particularly liked much of what Bendis has done since Daredevil, but I loved what he did here (and yes, there is some goodwill carryover from Deodato's Thunderbolts). His normally annoying dialogue (blathering Spider-Man) doesn't offend here as it is toned down a tad and works better through these particular voices. I've enjoyed these Dark Avengers books. Great review! This series was a nice extension of the Ellis T'Bolts. Bendis' run doesn't quite have the same nasty edge as Ellis' but it was a lot of fun. Loved Moonstone's "seduction" of Marvel Boy - Ares' reaction to MB's reaction is priceless. Personally, I'd suggest reading Utopia before getting into Molecule Man, even though it's not penned by Bendis, but it does take place in between volume 1 and 2. Either way, I enjoyed DA while it lasted. Probably much more than most of Bendis' other Avengers work, which is strange considering this is an Avengers team consisting of the likes of Bullseye and Venom. @matches: In fairness to Bendis, a good ninety eight percent of the comic writer pool doesn't have the kind of nasty edge Warren Ellis does. That man can write some seriously screwed up **** when he wants to. Maybe Garth Ennis is another of those writers - though he can at times slide too far into gross or over the top - but that's about it. I enjoyed Dark Avengers tremendously, at least the first two arcs and find this review to be spot on. It's some of Bendis' better work and without too much inane dialogue. I love reading Osborn with Willem Dafoe's voice, Moonstone with Sharon Stone's, Gargan's with, well, whoever performed him in the '90s cartoon, though I haven't got a good voice for Daken and I'm not even sure what sort of accent he might have. Japanese or German. I dunno.